We accept cash, travelers checks, personal checks and major credit cards. All business is done at the office, not at manifest. What are the jumping requirements? 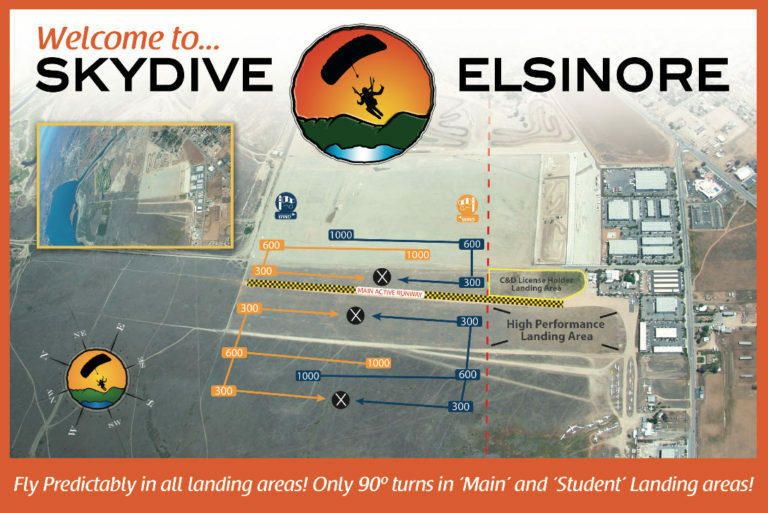 Skydive Elsinore is a member of USPA. Please be prepared to show current USPA membership, proof of your license status and an in-date packing card when you buy your jump tickets. A signed log book may be necessary to prove currency. Purchase jump tickets in the office. Manifest is in the office during the week and in front of the snack bar on the weekends. Manifest only when you are ready to jump. Missed loads might not be refunded! Please be ready at the loading area when you hear your five-minute call. What are the requirements for take off? RIG MUST BE ON – leg straps and chest straps correctly threaded prior to boarding. Seat belts must be worn on the plane until 1,000 ft AGL – no exception. If you choose not to wear your helmet, you must secure it to your chest strap or seat belt. The pilot spots the plane and generally no corrections are needed. Open the door and be ready to go at the orange light. The solid green light is the exit light. All groups continue to exit until the green light is off. Stay in the airplane for another jump run. What are the exit orders? Exit Order: Belly – largest to small groups, Belly Tracking, Freefly – largest to small groups, Freefly Tracking (any kind of tracking other than belly tracking: angle, steep tracks, moving tracking jumps), Students, Tandems, Wingsuits, Crew. Special note: Skysurfers (yes, we have the occasional skysurfer) will exit 2nd or 3rd out on the first pass to ensure that they are directly over the DZ. With reported upper winds of 0-10 knots, please allow between 5 – 7 seconds between exits (take into account the time it takes to climb out of the aircraft.) For winds of 15 knots or higher please use the following formula: Take Upper winds and divide by half which will give you the recommended amount of time between exits! What are the landing rules? Check out the aerial map of the landing areas, also available in the office. There are three landing areas. DO NOT Cross the runway below 1,000 feet. • LANDING PATTERN – If landing in the main/student landing area (the area between the primary runway and Cereal Street), towards the dropzone (180 degrees from the lake), use left hand pattern. Everything else, use right hand pattern. If you are landing between the main runway and the glider runway: right hand pattern toward the dropzone (180 degrees from the lake), left hand pattern toward the lake. • MAIN / EXPERIENCED LANDING AREA – directly in front of the packing area, up to the tetrahedron. You must have 200 jump/C-License minimum. In light/variable winds, land towards the lake. First person down sets the pattern. No more than a 90-degree turn on approach is allowed. No holding in brakes, spiraling or carving over or through this landing area. Watch for heavy traffic. • STUDENT LANDING AREA – all land north of the tetrahedron. Use student windsock for directional control. Follow the first person to land. Students have the right of way. In light/no winds, land toward the lake. Please fly your base leg over or north of the tetrahedron (do not fly your base leg over the main landing area as this is a very heavy traffic zone). • HIGH PERFORMANCE LANDING AREA – to the left of the main landing area. Use Extreme Caution! There are no restrictions on the direction of landing or degree of turn. Please advise others in the aircraft of your intentions. Extreme caution and visual awareness is advised. Only the most aggressive canopy pilots should land there. Sometimes less experienced jumpers land in this area due to the size of the group or the spot or other unforeseen circumstances. High performance canopy pilots: please be cautious – swooping is a privilege, not a right.